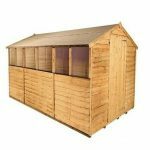 Your storage needs are going to be very well taken care of with the high quality Hartwood 6′ x 4′ FSC Windowless Overlap Apex Shed. 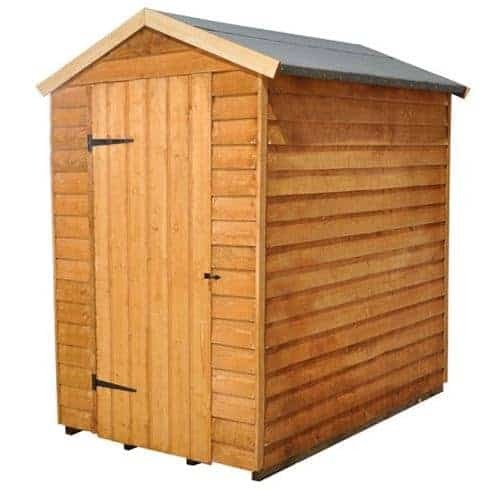 This is one very charming shed that has a very classic style to it that will make it stand out in any garden. 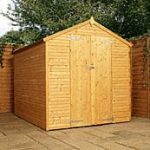 The size of the shed is ideal for gardens of all sizes and the storage space that it offers is actually far more than you would think. Its generous height can be taken advantage of by adding in some shelving which will greatly increase the amount of storage space you have. 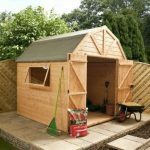 With a very eye catching look and a decent amount of space this is one very impressive and reasonably priced shed. Do not let the good looks of this shed fool you. This is one very strong, reliable and long lasting structure that thanks to things like the 8 mm thick overlap cladding and the very robust frame inside, is going to give you many years of use. The floor they have used is able to take a lot of weight thanks to the well made, floor joists that it sits on to of. The apex roof will force the rain to always run off the shed and it is strong enough to handle the weight of many inches of snow. 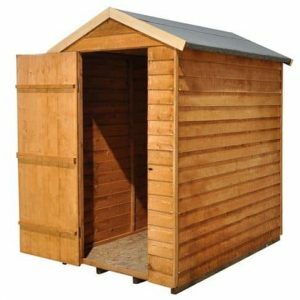 With a very attractive design the Hartwood 6′ x 4′ FSC Windowless Overlap Apex Shed is an ideal shed for those of you looking for a decent amount of storage space, but do not want a shed that costs a fortune or takes up a whole lot of space. This is a structure that has that classic shed look to it – when you say the word shed this is the type of building that pops into your mind. It is a style that will fit in well with any garden and will never seem outdated. This is not a huge shed, but the size we feel still does offer you a decent amount of storage space. 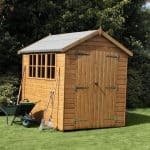 The width of the shed is an impressive 6 feet, the depth 4 feet 3 inches and the height at the eaves is 5 feet 4 inches. So as you can see, while 6 X 4 may not sound like a great deal when you break it all down and actually think about it then this does offer you a fair bit of space. An apex roof is what is going to be stopping the rain pouring in and actually thanks to the apex design the rain will not be able to sit on top of the roof it will always run off. The roof is going to have a very long life as the materials used for it are made to last. They have used some very nice looking sand felt that covers solid sheet boarding and this makes for quite the robust combination. It is not just the roof that is going to be keeping your items safe from the rain as the walls are made with 8 mm thick overlap cladding, which as well as having a great look stands up against bad weather and is also strong enough that if you have children it can take them throwing things at the shed even though you have told them repeatedly not to. Any shed that is going to give you many years of use has to have a strong and long lasting frame inside it and right behind that gorgeous, overlap cladding is a 28 mm x 28 mm frame that is nice and thick and really makes this one very sturdy shed. One of the worst things to happen to a shed is for its frame to not be strong enough so that when you touch it you can feel how flimsy and weak it is. This frame they have used simply will not allow that to happen. They have used solid sheet boarding for the floor and this along with the floor joists makes for one very strong floor that is able to handle a lot of weight. Things like a lawn mower, heavy tools and your weights and weight bench you bought three years ago, but never used will be able to sit on this floor and it will happily take that kind of weight. The wood will be dip treated before it is sent your way and this will look after the wood while it is being delivered, during installation and also the first couple of weeks of the sheds life. You will need to give it a generous coating of wood treatment shortly after construction so that it will not start to suffer with rot. Now this will need to be reapplied once a year, but before you start moaning it will not take all that long and it will also keep the wood rot free so it is something you have to do. 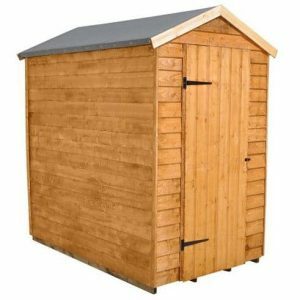 Now we did just say you will have to treat the shed and that is true as you do not want it start to show signs of rot, but also the ten year anti rot guarantee they are giving with this is only valid if you treat the wood. One of the most surprising aspects of the Hartwood 6′ x 4′ FSC Windowless Overlap Apex Shed is the door. The pictures really do not do this door justice, as even though it is a single door it is over two feet wide so getting things and yourself in and out of the shed is going to be easy and not require you to twist and turn things like you are playing some giant life sized version of Tetris. Two black hinges not only give the front of the shed a little bit of decoration, but they allow will ensure the door does not sag. This particular shed has windowless in its name so we really cannot put it down for not having any windows now can we? The door can be closed with a hasp and staple, but there is no included padlock or anything like that to keep thieves out. This is something that you will have to add yourself and something that is worth doing if you do have some items that are expensive inside here. This windowless shed is 100 percent private unless you leave the door open of course. But being serious there is no way for a person, no matter how nosey they are, to be able to see what items you have inside your shed. 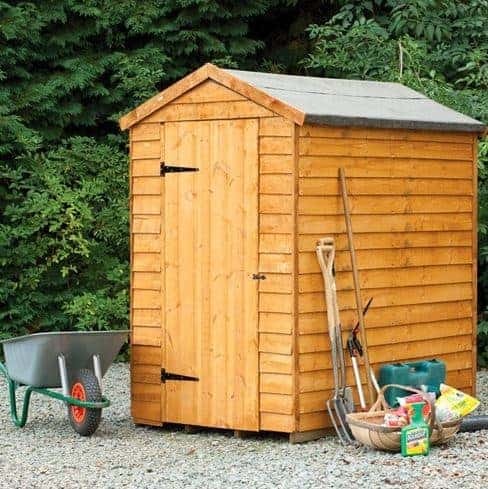 This is a shed that we feel would look very appealing in many different colours, but one way to add a bit of colour and also help the shed at the same time is to get a wood treatment that is coloured. Red, green and even shades of blue wood treatment can be bought these days, so no matter what colour you like or will fit in with your garden there is bound to be a wood treatment out there for you. 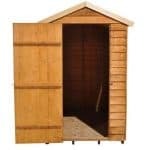 Three extras are offered with this shed. The first one is a Yale Hasp Steel Black Finish 120 mm and Brass 40 mm Padlock which costs £19.99 and will make it so you can securely lock up your shed. If this is not enough security for you, then you may want to pay the extra £10 and get a rather high tech, alarm security system that comes in at a rather fairly priced £29.99. The last extra they have is a plastic base which will help the floor. 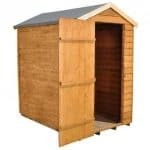 If you are going to be installing this shed on grass then the plastic base at £69.99 is worth having a think about. While you can see from the pictures what an attractive shed this is. They really do not do justice just how well made and high quality it is, especially for the price it is being sold for. This is the kind of shed that 20 years from now will be still standing strong in your garden. Just make sure you give it the proper treatment and it will not just be standing, but standing looking good as well. 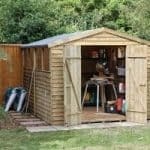 While not a large shed, there is still a decent amount of storage space for you to make use of. If you add shelving and carefully store things on the floor then you can really get a lot out of the space you have. We considering this to be a fairly straight forward DIY job. Just be sure to get a friend who is not too annoying to help and you will have this done in 4-6 hours. We are very happy with this shed and are sure that once it is installed and you start filling it up, you will feel like you have made a very smart purchase. Final Thoughts: Sure, the Hartwood 6' x 4' FSC Windowless Overlap Apex Shed may have a rather odd name, but this is one very impressive storage shed that is going to be something you can rely on to take care of your storage needs for a few decades. It has been designed to last and they have also ensured that it is very easy on the eyes and is something people will be actually happy to have in their garden. 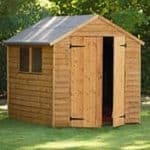 The price they are asking for this is very reasonable and we feel that if a shed which is not too large, but also not too small is what you are after that this is a shed that at the very least should make your shortlist.